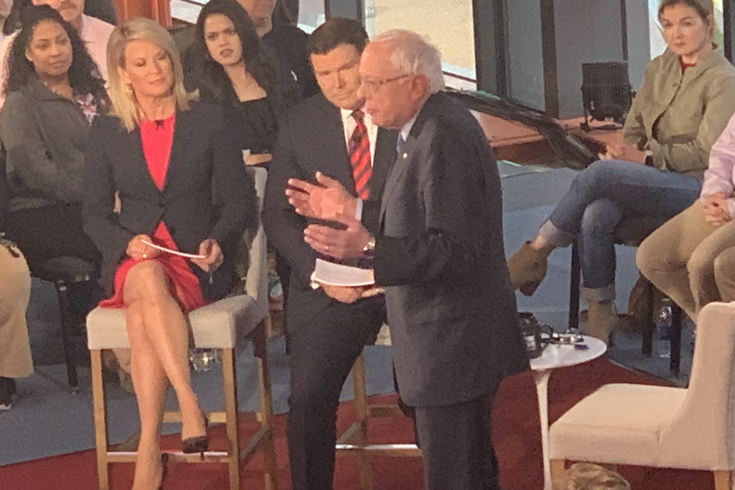 Democratic presidential candidate Sen. Bernie Sanders, right center, with hosts Martha MacCallum, left center, and Bret Baier on stage for the Fox News town hall on Monday night in Bethlehem, Pa.
Only in America is a place like the SteelStacks in Bethlehem possible, or even imaginable. 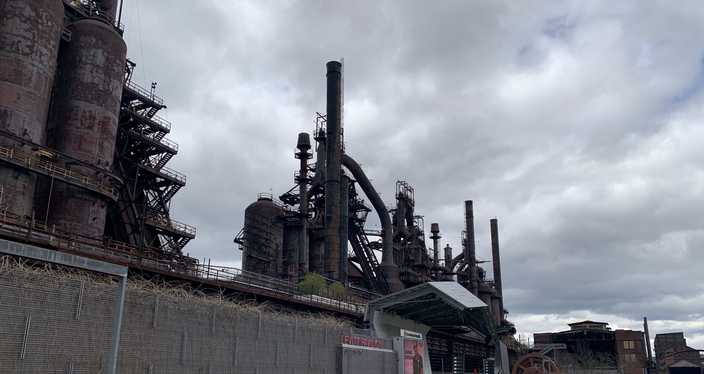 Opened in 2011, it's an entertainment district, with a theater and other venues, adjacent to the long-closed Bethlehem steel mill. Part of a real estate trend of iconic buildings being repurposed for modern usages, the SteelStacks represent a vision for the future of a town, built in the literal shadow of the past. It's almost as remarkable a juxtaposition as an avowed Democratic socialist being interviewed for an hour by a notoriously conservative-leaning news network. On Monday night, at the SteelStacks' ArtsQuest Center, Sen. Bernie Sanders of Vermont appeared for a nationally televised town hall live on Fox News. The senator is the only candidate for the 2020 Democratic presidential nomination to date who has agreed to participate in a Fox town hall, with just about every other presidential contender going on CNN or MSNBC instead. Sanders, who drew throngs of supporters to Philadelphia during the Democratic National Convention in 2016 even though he was all-but-officially out of the race at the time, has been campaigning heavily in Pennsylvania of late, drawing big crowds in Pittsburgh last week. At the hour-long Bethlehem event, in which Sanders was interviewed on stage by anchors Martha MacCallum and Bret Baier, the tone was contentious but generally respectful. "I guess the president watches your network, a little bit," Sanders said, before adding that "your network does not necessarily have a great deal of respect in my world, but I thought it was important to have a serious discussion on serious issues." About 30 minutes before the event began, Sanders released the last several years of his tax returns, which indicated that he had earned more than a million dollars in 2016 and 2017, due in part to robust sales of his 2016 campaign memoir. The candidate said that he supports a tax system that is more fair, and has fewer loopholes for corporations. "Why don't you get Donald Trump up here and ask him how much he pays in taxes?" Sanders said. In an apparent gaffe by MacCallum, she asked Sanders about his proposal for a 70 percent "wealth tax." Fellow Democratic candidate Elizabeth Warren, not Sanders, proposed such a tax plan. Throughout the discussion, the questioning got into a pattern: The Fox hosts asked Sanders how he could possibly pay for his different ideas, whether health care or free college, and the candidate was mostly ready with answers. "We pay for what we are proposing, unlike the president," Sanders said. The Fox hosts also tried to get Sanders to criticize a couple of his primary opponents, but the senator didn't take the bait. When asked about his age – Sanders is 77, and would be 79 upon taking the oath of office in 2021 – the candidate replied that it was a fair question, while inviting doubters to "follow me around the campaign trail." "It's not whether you're young or whether you're old, it's what you believe in," he added. The Fox News town hall was held in the shadow of old Bethlehem Steel mill in Bethlehem, Pa. In between questions from the moderators, Sanders took several from the crowd, including a few that were hostile to some degree. Bryan Callahan, a Democratic city councilman from Bethlehem, expressed concern that the Democrats would move too far left and hurt themselves politically. And when asked by someone in the audience how he feels about free trade, Sanders replied that he voted against NAFTA, the Trans-Pacific Partnership, and other such agreements. When asked his opinion on recent comments by Rep. Ilhan Omar of Minnesota, Sanders said that, while he's only met Omar on a couple of occasions, he does not believe she is an anti-Semite. "I support a Muslim member of Congress to not be attacked every single day in outrageous, racist remarks," Sanders said. Sanders added that he doesn't talk a lot in public about the Mueller Report and Russia investigation, because "everyone else is talking about it," but called for the report to be released to the public. 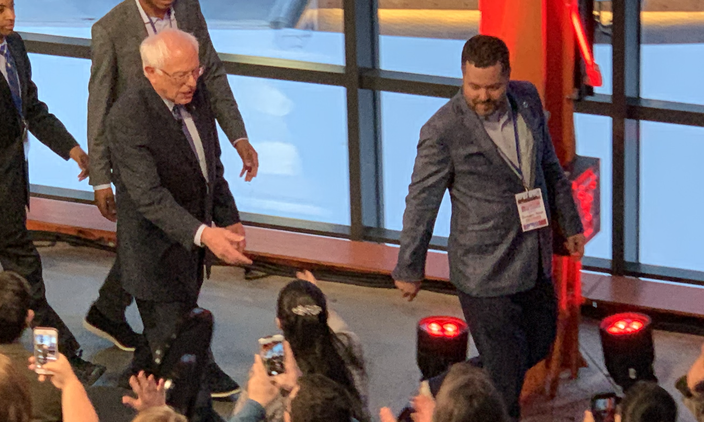 The event had some heckling – most of it pro-Sanders – and a few audience members trying to ask questions out of turn or objecting to questions from the Fox moderators. Also, some counter-protesters showed up outside the venue, and some of them could be seen waving Trump flags on the lawn below. A van parked outside sold Trump merchandise, while a lone vendor offered Sanders shirts. A lone Bernie Sanders t-shirt vendor stands in front of a Trump merchandise truck, after the Bernie Sanders Fox News event Monday night in Bethlehem, Pa. It was, for certain, much more of a Bernie Sanders crowd than a Fox News crowd, although the point of the event was more that Sanders is hoping to appeal to Fox viewers at home. The crowd at the event didn't exactly match up with popular demographic conceptions about Sanders supporters. There was young and old, male and female, and not many people in tailored suits. Fox reportedly reached out to local political groups in order to fill the crowd, including some in Philadelphia. Bernie Sanders shakes hands with supporters after the Fox News town hall on Monday night in Lehigh County. "I disagree with Donald Trump on virtually every issue," Sanders said of the president. "I'll tell you what upsets me the most, whether you're a conservative or moderate or progressive, I don't think the American people are proud that we have a president who is a pathological liar." But Democrats must offer things of substance in the election, Sanders cautioned. "If we spend all of our time attacking Trump, Democrats are going to lose."